plaque, a photo by jahansell on Flickr. I got a nice email a couple of days ago from the granddaughter of Anne Gudernatch. She spent much time visiting Sharon and her grandmother as a child, but says she hasn't been back in many years. She asked me to visit this plaque, which is at the base of a cherry tree at the entrance to Mudge Pond. The plaque is looking fine, but the tree is not yet blooming or leafing out - I hope it's still alive. If not, perhaps those who planted it would consider replacing it? 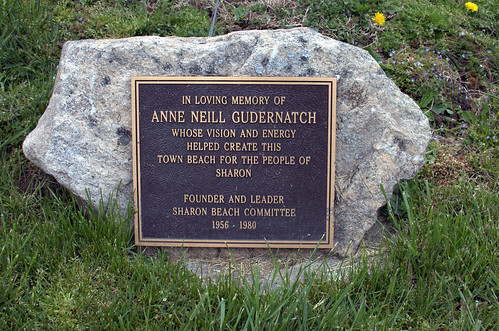 It's clear Mrs. Gudernatch did a lot for the town! Thanks for posting! And thank you for taking the time to correspond with me. I LOVE this blog! I am very proud of both my grandparents. My grandfather, Dr. G.S. Gudernatch practiced medicine out of his office in the family home on Main Street for almost half a century. He delivered generations of Sharon's families. Over the course of his life he served as Police Surgeon, Director of Health, Chief Medical Examiner, something for the fire department?? ?...He was an amazing man who loved his town. I hope some of your readers will fondly remember both of my grandparents.